Identification: Male antennae are yellow. 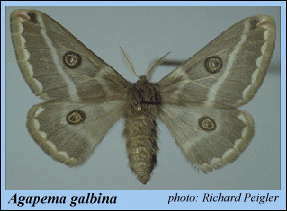 Upperside of wings is gray to grayish brown; male is whiter at the wing bases. Wing margins are brown, median line is white. Black marking at forewing tip runs parallel to the costa. Wing Span: 2 3/8 - 2 7/8 inches (6 - 7.4 cm). Life History: Adults are attracted to lights. Mating occurs at night, and females lay eggs in large clumps on the host plant. Eggs hatch soon after they are deposited, and young caterpillars feed in groups. Caterpillars quickly complete their development and spin cocoons before winter. Caterpillar Hosts: Brazilian bluewood (Condalia hookeri). Range: The lower Rio Grande Valley of Texas west to southern Arizona; south to Tamaulipas and Baja California, Mexico. 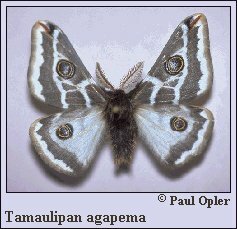 Conservation: Has not been reported north of Mexico since the 1960s; may be extinct in the United States. If found, populations should be conserved and monitored.